Here’s a feel-good love story that’s as sweet as pie. 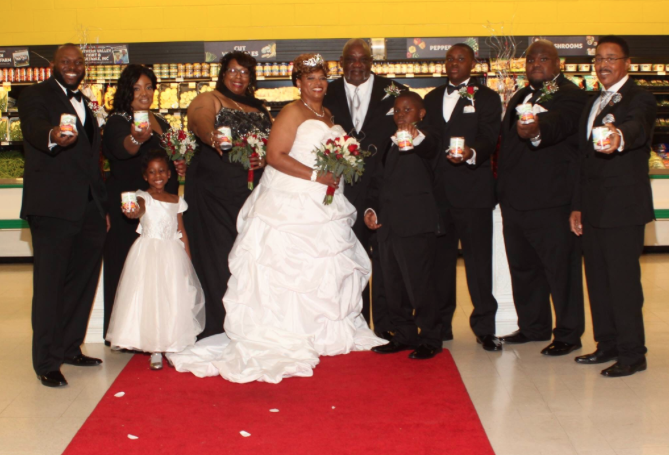 Love was in the air, and in aisle three, when over 70 guests watched a Georgia couple exchange vows next to beans, greens, potatoes, tomatoes, and lamb at an Albany grocery store. When guest began to share the photos online, of course they went viral on Twitter. Lovebirds Charles Larry Tinson and his new wife, Mary Tinson, chose to hold their Thanksgiving wedding at the very same grocery store where they reunited just four years ago. After returning from a tour in Afghanistan, Charles stopped by Harvey’s Supermarket to look for some cranberry sauce to go with his Thanksgiving meal. While browsing down the aisles that day he bumped into a very familiar face he was once very fond of, and he and Mary, his former crush, reconnected and began dating from then on. “I heard someone say ‘Hey girl’ and I turned around and said ‘Oh my God, Larry? I haven’t seen you in over twenty something years,” Mary Tinson told WTVM. Charles thought that tying the knot to his soulmate should take place at Harvey’s. The supermarket worked with the groom on details like live music and a wedding cake topped with cranberries. Thanksgiving was the perfect way for this couple to enjoy the holiday with family, friends and of course the cranberries that brought them together.